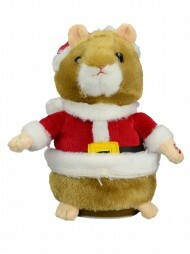 Christmas carols, dancing, and holiday cheer: these are three things the animated holiday plush has in spades. From traditional characters to funny twists on classic favourites, our selection of battery - operated plush figures will put a smile on your face and bring laughter to your home. Give as a gift or use as part of your decorating scheme to surprise guests and spread the cheer of the Christmas season. 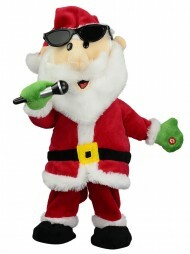 For extra laughs, opt for a humorous character that sings joke songs and shimmies to the beat. Watch as your mini plush figurine busts a move and gather your friends and family to enjoy the show. Plush figurines add a warm, cuddly feeling to traditional animated figures, which are often made from harder materials. Plush figures, unlike those designed for shelf display only, can be handled safely without causing harm. Motorized plush characters can easily be passed from friend to friend without fear of breaking the typically delicate details of traditional Christmas figurines. Hold the figure in your lap or place it on the floor to excite your pets and young family members. Set your new plush friend by your bedside, on a bookshelf, desk, or coffee table to enjoy the silly song and dance of the holiday. Invite friends and family members to switch on this battery - powered delight and watch their surprise as the figurine comes to life in an unexpected way. 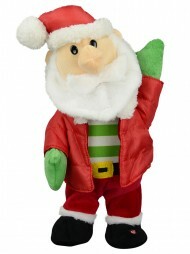 Delight in the element of surprise and seasonal charm that your plush figurine has to offer. Whether your plush makes a playful reference to pop culture or moves to the sound of a classical Christmas carol, its animated movements are sure to add excitement and novelty to your typical holiday routine. 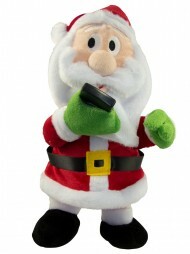 Give animated Christmas plush figures to your friends or family members to give the gift of laughter and whimsy. Make your younger family members laugh and play at the sight of this new life - like miniature. Soften up old Scrooge - like relatives with a hilarious dancing holiday character that’s just too ridiculous not to laugh at. Bond with your loved ones and help ignite the Christmas spirit in any heart with animated plush that’s just too cute to ignore. For households filled with the chaos of Christmas, a plush figurine provides a safer accident - free alternative to the traditional ceramic or hard fabric display figure. Whether you’re entertaining small children, lively relatives with stray elbows, or feisty pets, your holiday decorations need to be safe, durable, and easy to maintain. After all, you have more important things to worry about, like gift - wrapping, holiday baking, and preparing Christmas dinner. With a decorative plush animated figure, your home ornamentation doubles as a safe - to - handle toy that entertains guests and allows you to focus on more pressing holiday matters. An added layer of stuffing and plush material protects the important mechanisms and battery - operated console of your figurine, which prolongs the life of your seasonal item. 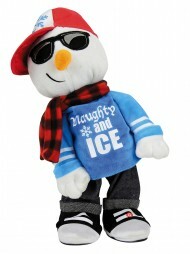 Allow your family to pass around the animated character, or let young ones interact with this dynamic décor item. When you’re finished enjoying the figure up close, you can simply return it to its location as a display item to warm your home and hearth. Its hassle - free construction is also easy to keep tucked away until it’s needed. Skip the bubble wrap, tissue, and newspaper, and instead simply store the item in your yearly holiday bins for safe keeping until next year. Plush can fit easily into any open space in your storage bins and easily reassumes its shape after fluffing. The extra padding acts as built - in storage protection and helps cushion other items around it. When Christmas comes again, simply unload your plush figure and freshen its batteries. Your family will love seeing their familiar little plush figurine take its traditional holiday spot on the coffee table.